A team of C&IS students won a Bronze Pencil in the One Club’s Young Ones College Competition and were selected for Honorable Mention in the Young Ones Client Pitch Competition. This is The University of Alabama’s first Pencil award. The Young Ones College Competition highlights great student work from around the world, awarding Gold, Silver and Bronze pencils to the top student work in advertising, design and interactive. Of the Young Ones competition’s 70 finalists from 16 countries, only 24 finalists won pencils. The client pitch competition had one winner and two honorable mentions from the nine teams. The students’ work is for Flight Plan, a fictional 501(c)3 organization that would work in partnership with the United Nations and Partners Global to turn the estimated 9.7 trillion unused frequent flier miles into physical, donatable items that could aid refugees around the world. As an in-flight passenger experience, passengers would elect to exchange their miles earned on their flight into food, clothing and hygiene products to reduce the likelihood of disease and violence in refugee settlements. Additionally, frequent fliers could log on to Flight Plan’s website to exchange their unused miles for the same aid packages. 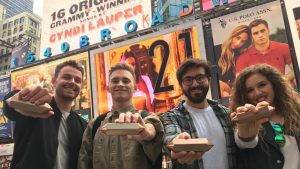 “It was so amazing to work on a project that can change the world for good and show our creativity to the ad industry at the same time,” said Britt Buzan, of Jacksonville, one of the UA students on the Pencil-winning team. Other students on the team are: Ryan Arth of Annapolis, Maryland; Sydney Estill, of Birmingham; Allie Petko, of Parker, Colorado; and Brett Van Gorden, of Lancaster, Pennsylvania. The Young Ones College Competition fits in line with the One Club’s mission to educate and inspire students of the advertising business and to benefit the next generation of creatives through scholarships and portfolio reviews. Winners were announced in New York City at the 2017 One Show, a showcase for the world’s best work, inviting collaboration among individuals who are actively developing outstanding work.